Egypt’s presidential poll results have been delayed by the election authorities, raising further tension across the country. The results had been due to be announced on Thursday, but the election commission said it needed more time to look into complaints presented by the candidates. 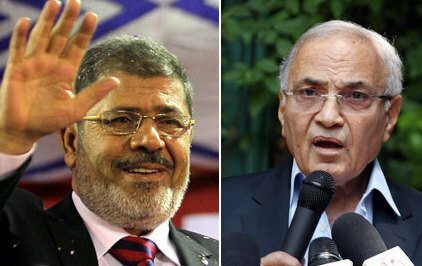 The Muslim Brotherhood’s Mohammed Mursi and former PM Ahmed Shafiq both claim they won last weekend’s vote. Thousands of opposition supporters are protesting in Cairo’s Tahrir Square. They have gathered to demonstrate against the delay in announcing the poll result and also against the Supreme Council of the Armed Forces (SCAF) – the military council that has led the country since President Hosni Mubarak was ousted last year. The Muslim Brotherhood called people into the square to voice their outrage over recent constitutional amendments which gave the SCAF sweeping political and legislative powers. If the Muslim Brotherhood has won the election, there are doubts over whether the authorities would allow them to take power after fighting them for so many decades. There is increasingly fevered speculation about whether the election will be cancelled or rigged, he adds. Meanwhile, 84-year-old Hosni Mubarak remains in critical condition at an army hospital in Cairo. He is said to have had a series of strokes and to be on a life-support machine, but there has been no official word on his condition. Earlier this month, Hosni Mubarak was sentenced to life in prison for his role in the death of protesters during last year’s revolution. Correspondents say there are fears that Hosni Mubarak’s failing health could be used as a distraction as Egypt awaits the result of the hotly disputed election. On Wednesday, the Higher Presidential Elections Commission (HPEC) said that some 400 election complaints had been filed by the two candidates. The commission said it needed more time to investigate the complaints, without giving any new date for the announcement of the results. However, media reports suggest that the poll winner could be declared over the weekend. Nader Omran, a spokesman for the Muslim Brotherhood, said the announcement should not have been delayed. “It will bring more tension to the people – they should end the story tomorrow (Thursday),” he said. Protests continued in Tahrir Square late into the night, with the Brotherhood saying they will mount a sit-in until the results are announced, and until the army gives up the sweeping powers it granted itself in a constitutional amendment last week. Correspondents say Egypt appears to be in political and constitutional limbo. In preliminary comments on the second round of the presidential election, a group of international election monitors headed by former US President Jimmy Carter voiced concerns about the “political and constitutional context” of the vote. “I am deeply troubled by the undemocratic turn that Egypt’s transition has taken,” Jimmy Carter said. On Saturday the SCAF had dissolved Egypt’s elected parliament – dominated by the Brotherhood – after a court ruling that last year’s legislative polls were unconstitutional. Late on Sunday, hours after the polls closed in the presidential vote, the SCAF issued a constitutional declaration giving itself wide-ranging powers and limiting those of the incoming president. The declaration effectively gave the SCAF legislative powers, control over the budget and over who writes the permanent constitution. The SCAF’s moves were widely condemned by activists as amounting to a military coup.